Based in South Florida, we understand that flooding and water damage can happen at any time. 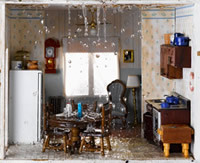 Water damage can happen as a result of heavy rain, power failure, broken appliances, foundation leaks, sump pump failure, broken pipes, sprinkler lines, flash floods, backed up washers, sinks or tubs, or a broken water heater, sewer backups or any other flooding around your property. Atlantic1 is on call 24 hours a day, 7 days a week for water removal emergencies. We put a priority on water damage situations to prevent mold and mildew problems as well as structural damage to the home. Atlantic1 Leaks & Flood Damage Cleaning is certified by the Institute of Inspection, Cleaning, Restoration Certification (I.I.C.R.C.) and follows the guidelines set to ensure each situation is dealt with appropriately. The first thing you should always do in a water damage situation is stop the source of water from coming in. Once the source of water is stopped we can begin to contain the damage. We extract the carpet and padding as thoroughly as possible into our recovery tank in our truck mount. If necessary we will remove padding and tackstrip. We then treat all contaminated areas with an Antimicrobial. This topical treatment will prevent mold and mildew from growing and retard any growth that may have already started. We then leave commercial air-movers and commercial dehumidifiers to dry the affected area. Equipment should always be left running for a minimum of 3 days to ensure proper drying. Sometimes the carpet may feel dry in less than 3 days but the baseboards and drywall may still be retaining some moisture. After this visit our office will contact you the following business day to schedule an appointment to re-install new padding and reinstall the carpet. We will also pick up the drying equipment and clean the affected areas that got wet during the flood damage. Water damage that affect only part of a room or area, or losses with lower permeance/porosity materials (e.g., plywood, particle board, structural wood, VCT, concrete). Little or no wet carpet or padding is present. Minimum moisture is absorbed by materials, releasing moisture slowly. Water damage that affect an entire room or carpet and cushion. Water has crept up walls 12" - 24”. There is moisture remaining in structural materials (e.g., plywood, particleboard, structural wood, concrete). These consist of wet materials with very low permeance/porosity (hardwood, plaster, brick, concrete, stone). Typically, there are deep pockets of saturation. Often times people ask themselves: "Do I really need to call in a professional for this?" The truth of the matter is that when it come to water removal, there are many factors to consider, particularly when it comes to health risks involved with mold spores. You want the job done quickly and efficiently to prevent any future problems associated with water damage. Many people consider a DIY approach to water removal to save money, but often times they end up calling a Professional anyway. What should I do after a flood, sewage or water damage occurs? If you are not insured for Water Damage, Mold Removal, or Moisture Removal services, or you have been denied coverage by your Insurance provider, we can offer you competitive pricing. Atlantic1 experts will first inspect the area and attempt to stop the water source from creating additional damage. We will then use our water damage machinery to remove any standing or access water from the site. Once the water is gone, we start the drying process with dehumidifiers and heavy fans. When the area is dry to our satisfaction, we test the air to make sure the problem is resolved and the moisture and any mold spores have been removed.